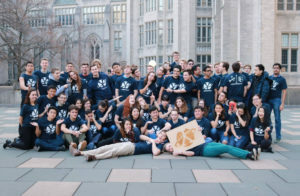 Faced with a lack of aerospace opportunities on campus, I co-founded the Yale Undergraduate Aerospace Association, where I served as Mechanical Team Leader, later Co-President and then Senior Advisor. Over the years, the organization grew from two people to the largest engineering organization on campus, with more than 40 active members. YUAA members work in teams to build and fly rockets, planes, quadcopters, and unmanned aerial vehicles. From first idea to finished aircraft, YUAA projects are entirely student-run. Since 2010, YUAA has helped foster Yale’s engineering community by welcoming students of any experience level or background and hosting events to promote aerospace engineering on campus. My experience at YUAA was essential not only thanks to hands-on design, development and testing of aerospace projects, but especially regarding team leadership and other soft skills such as seeking funding, budgeting, reporting and presenting the results of the student organization. This entry was posted in Hardware, Leadership, Systems. Bookmark the permalink.